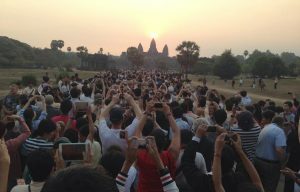 What a difference a year, # overtourism and some negative publicity can make. For the past two years I have returned from the World Travel Market with my heart in my boots – see Walking the halls of WTM with hope and despair (2014) and 2015 – Responsible Tourism Day: Shock and Awe. Last year, climate scientist Kevin Anderson informed theWTM audience that we need to immediately cut emissions to ensure warming was held at a 1.5 degree increase. This level is necessary to prevent those living in small islands around the globe from losing both their homes and any livelihood from tourism or agriculture. That wasn’t the only bad news. The really bad news was the “cognitive dissonance” that followed as key industry spokespersons dodged and dived the implications. Now fast forward a year, to less than a week before WTM 2016, and the mood is very different. Over the past few months, we’ve experienced riots in Venice, protests in Barcelona, the closure of islands in Thailand and a host of stories in the mainstream describing the ills of “overtourism.” At the same time, global temperatures reached the 1.5 degree threshold and while the airline sector did make a key agreement, its successful implementation will still fall short of the cuts needed. The negative press this year seemed like a rising tide of opposition – a metaphorical counterpart to the rising waters in the Pacific. The reputation of tourism as the great generator of employment, foreign exchange, well-being and even peace, was being questioned. Clearly feet were getting wet and the PR machine that serves as “reputation management” went into action. 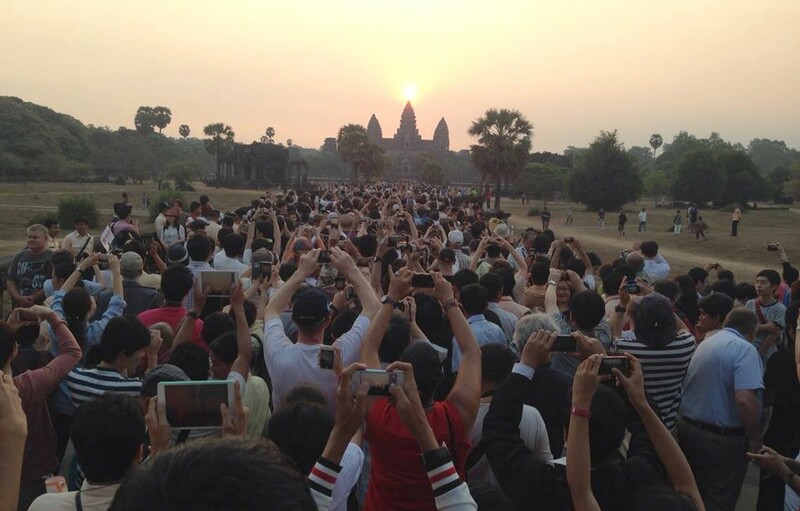 The Travel Foundation, funded by the largest tour company in the world, felt it safe to pick up the theme of overtourism and do some soul searching as reported here and here. Around the same time, “the self-proclaimed “Authority” on tourism – the World Travel and Tourism Council (WTTC) published a confessional Why Tourism Needs a Rethink! A video reassured us that the tourism industry figured out how to be more efficient and collaborative while continuing to grow tourism the way it always had (See Medium article with video embedded) or my previous post Comparing Apollo 13 with mass tourism. So, given this reoccurrence of cognitive dissonance, I am as conflicted now as I was last November but for different reasons. Then, the need for radical structural change was openly resisted – in fact one leader stated that to oppose growth was defeatist. Now we have representatives of mainstream tourism actually saying we need to re-define tourism and operate differently (WTTC) and measure its full impacts (Travel Foundation). I can’t disagree with any of that and genuinely applaud the volte face. Time flies when you’re facing a rising tide, and it’s important to note that change can be imposed with remarkable speed if conditions are right. It was only 3 years ago that Carbon Tracker published its findings that, should all the assets on oil company’s books be realized (ie. extracted and burned as fuel), then global warming would dangerously exceed the 2 degree target deemed as safe (see The Burning issue of Carbon). That “aha” moment spread quickly infecting students, pension funds, university endowments and the investment community, and started the fossil disinvestment movement. Negative attitudes to the stock of fossil fuel companies were unthinkable 5 years ago and the concept of stranded assets didn’t enjoy widespread recognition. If the negative effects of over tourism become more obvious, and if coastal erosion, coral bleaching or cyclones increase in intensity, will tourism face a “stranded asset” problem also? It’s in this context that I argue that the writing is on the wall for tourism as currently practiced. I am not saying it will stop dead in its tracks or that thousands of hotel beds will lay vacant BUT that it will experience a fundamental change – not just in the rules of the game but the game itself. An extractive “industry” that exploits people (cultures and the vulnerable) and places (beautiful landscapes, adventurous terrain, sacred sites, or rare wildlife habitats) for those with the capital, political power and “know how” to develop and distribute will cease to enjoy the licence to operate by an awakening citizenry. The latter, as exemplified by the brave indigenous men and women stopping the “black snake” in North Dakota, are realizing that, if they don’t protect the land, the water and life, their future will be toast too. The fact the WTTC and the Travel Foundation both state categorically that we have a problem with the status quo and tourism need to be “redefined” is very helpful. It creates a safer space for others to cease self-sensoring their own observations and concerns. But platitudes, confessions, incentives, punishments, regulations, taxes and well intentioned green practices and philanthropic gestures bolted on to business as usual won’t be enough. All of these initiatives are like updates to the same obsolete program. We don’t need a re-think but a whole new design. And, believe it or not, that’s why I am a cautious optimist. I am excited and inspired by the pace of deep change that’s taking place all around the travel and hospitality sector in general with islands of experimentation within it. This week, the Harvard Business Review has a series of articles devoted to Rebel Talent urging customers to encourage non-conformity, questioning and curiosity. These dynamics reflect a fundamental psychological maturation as individuals begin to reject the beliefs and assumptions of previous generations. It starts as an invisible shift, manifesting in a bewildering variety of ways that can distract and be misinterpreted as fads or fashion, but it’s huge. Failure to understand its cause, dimensions and power will be the biggest source of commercial failure over the next decade. Since I wrote Can Tourism Change Its Operating Model – the inevitability and necessity in 2012, Conscious Travel has been delving into the nature of a deep value shift that spells Transformation. Our new workshop, Fit to Flourish in an Age of Disruption is designed to prepare business owner-managers in travel and hospitality with the understanding and tools needed to ride this tsunami like wave to success in the 21st. Century. It’s where we outline the key steps to riding these waves of transformation. Please check out the workshop and drop me a line. It’s vital that those who “get it” stop working alone, join hands and put their creative brains and hearts together to design a better tourism.